The Ray N. Welter Heating Company is a family-owned HVAC business based in Minneapolis that specializes in heating and cooling system repair and replacement. The company has proudly served the Twin Cities community for more than 100 years and has built a loyal customer base. For several years, Welter Heating has maintained an educational blog on its website featuring helpful HVAC and home improvement articles. From HVAC types and costs to ideas for saving money on energy bills, the company’s blog offers a wealth of tips and tricks for homeowners. As an important marketing and customer service tool, there was an opportunity for Welter Heating’s blog to expand its reach to a larger local audience. Welter Heating wanted to increase brand awareness, traffic to the site and individual blog posts, and broaden its general audience. TopRank Marketing recommended integrating local community influencers as well as industry experts into the blog strategy. Influencers not only lend expertise and authority to content, but enable a company to tap into a new community of social followers to amplify its message. However, compiling a list of relevant influencers would not be an easy task. A challenge of building an influencer base of local HVAC experts is that many times, these experts are Welter Heating’s competitors. The process for this influencer integration campaign included concepting, compiling influencer prospects, engaging with influencers, drafting the blog and related social messaging, and following up with influencers to encourage them to promote the content. The first influencer post was “Thermostat Wars! Local Celebrities Tell Us What They Set Their Thermostat To,” and featured local news meteorologists, a news anchor and a young rapper/musician. Each influencer included in the campaign had a significant social media following and was easily recognizable to local residents. In just the first two weeks of the blog post going live, it received 609% more traffic than the average post receives all month. The graph below illustrates the major spike in traffic on publishing day, and continued elevation in the following weeks. The influencer post published on Oct. 4, 2015. The site experienced a huge spike in traffic and elevated traffic continued in the weeks following the post. This influencer-integrated blog post was the second-most visited page on the entire site, coming in just behind the homepage. Upon publishing, TopRank notified each influencer and asked them to share the piece with their social audiences. Amplification via influencers resulted in a 634% increase in social traffic month-over-month. 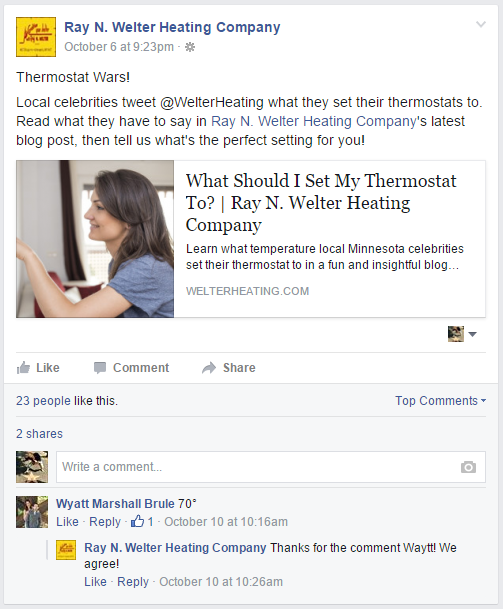 Aside from new website visitors, Welter Heating also experienced a high level of engagement in their related Facebook posts, as fans enjoyed learning how local celebrities battle over thermometer settings and sharing their own preferences. By integrating an influencer campaign with existing blogging efforts, Welter Heating was able to drive more traffic to their website, increase engagement and reach a broader audience. 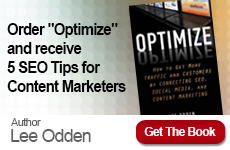 Are you ready to augment your content creation strategy with the power of influencers? 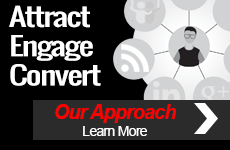 TopRank Online Marketing paves the way for successful influencer integration programs: contact us today to learn more.